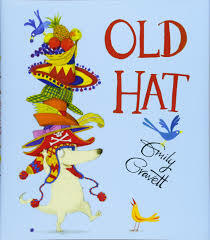 Our Cover to Cover Book of the Month for September is Old Hat by Emily Gravett. Explore this beautiful new book by Emily Gravett and discover how wonderful it is to just be yourself! Being yourself can sometimes be difficult in a world that calls for fitting in. In the book Old Hat by Emily Gravett, Harbet the dog tries to use hats to fit in but quickly discovers the enormous value of being himself! While reading Old Hat, talk to your child about all the unique and wonderful qualities that she brings to the world. Ask your child what she likes most about herself! Tell her what your like most about yourself. You can promote early comprehension skills while you read! Make predictions with your child about what both of you think might happen in the story. Use the illustrations to guide you! “Do you think that the other animals are going to like Harbet’s new fruit hat? Why or why not? How do you think Harbet feels about his fruit hat? Let your child express his own unique style by creating his own fun hat! Provide your child with markers and simple craft supplies and let them decorate the bottom of a paper bowl to create their unique design! Use things from around the house to decorate. Cheerios, macaroni, old bottle caps, cut up egg cartons and old magazines or mail flyers can be glued to the bowl for added uniqueness! The possibilities are endless! Send a picture of your child wearing her hat! Be creative! We can’t wait to see what you loved about Old Hat!